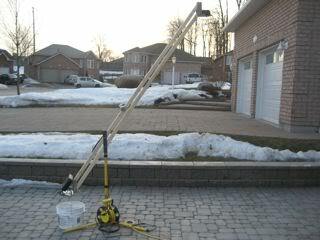 This is the Arduino-controlled, remote-firing ping pong ball launcher that my brother and I built. Every year at our cottage, our family holds an outdoor movie night. It is always a fun way to end the summer. I thought I would post some information on our setup, so that others could try it too. The screen is one of the most important parts of the movie night setup. We have spent years trying out different setups, but this year we have got it almost perfect. Our screen is a 183? 2.35:1 anamorphic widescreen that I build. 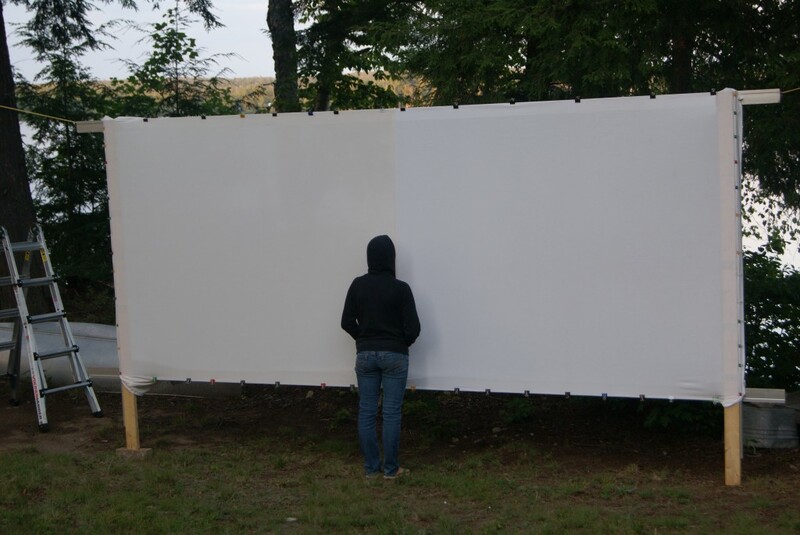 The goal was to make a screen that could be setup quickly with only 2 people. We use 2 16ft aluminum extrusions that are used to be the ledges on a chalkboard. These make up the top and bottom of the screen. Two 2×4?s are screwed to the aluminum extrusions, which make up the sides of the screen. They also are the legs of the screen. I also screwed two more pieces of aluminum extrusion to the sides of the 2×4?s. 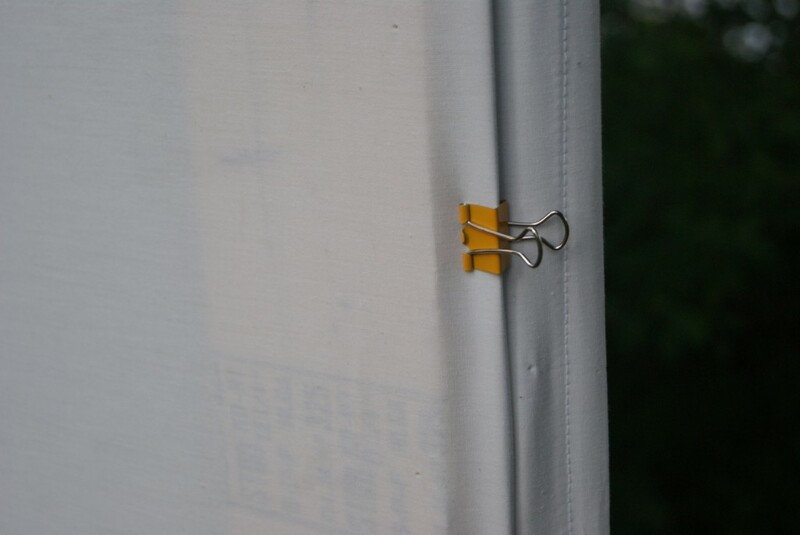 These allow the screen fabric to be held on using binder clips. It is important that you carefully measure the width and height of your screen. This will prevent you from having black bars on your screen. To calculate your width and height, you must first decide on an aspect ratio. Common aspect ratios are 4:3, 16:9 and 2.35:1. Your movie should say the aspect ratio on the back of the case. Now you need to figure out what you want the width of your screen to be. I chose to go with 14ft. Now divide this by the larger number in the aspect ratio (for example, 14ft / 2.35 = 5.95ft). This will be your height. 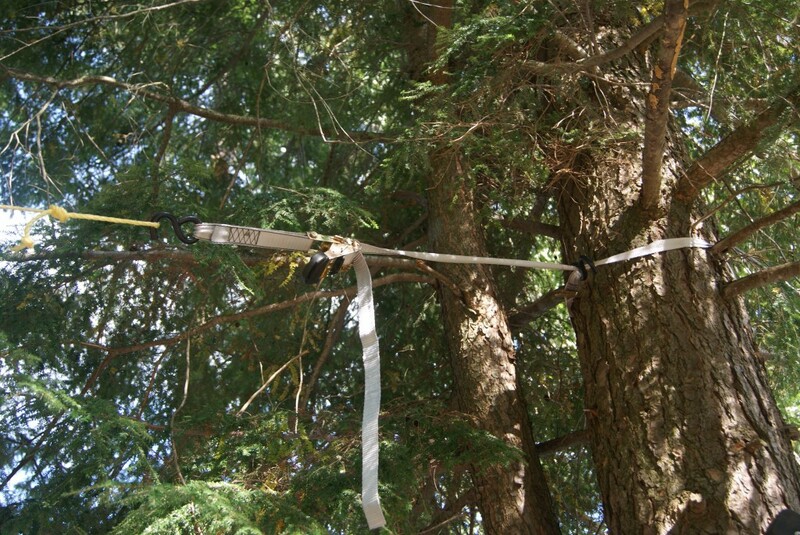 A rope is run through the top extrusion. 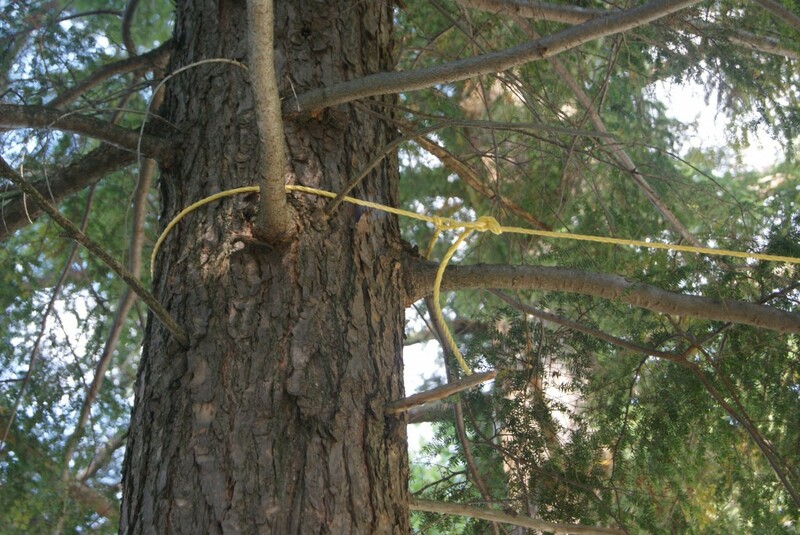 This is rope is tied between two trees and tightened with a ratchet strap. 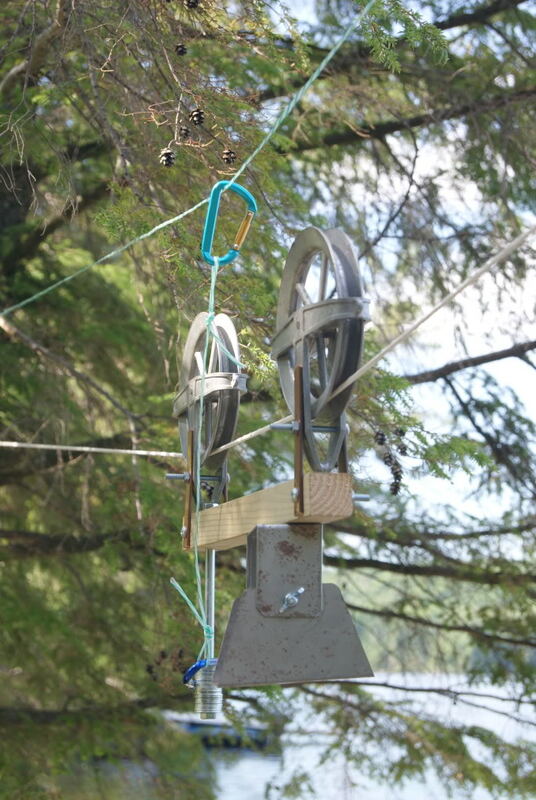 This holds the screen upright, and prevents the wind from blowing it over. 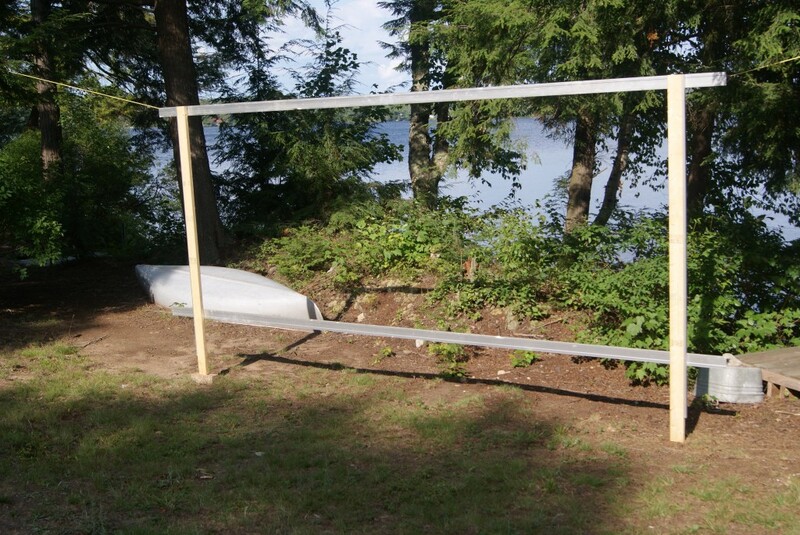 Now that the frame is up, it is time to attach the screen fabric. This is really easy, because the aluminum extrusions allow you to hold it on with binder clips, which are available from any office supply store. 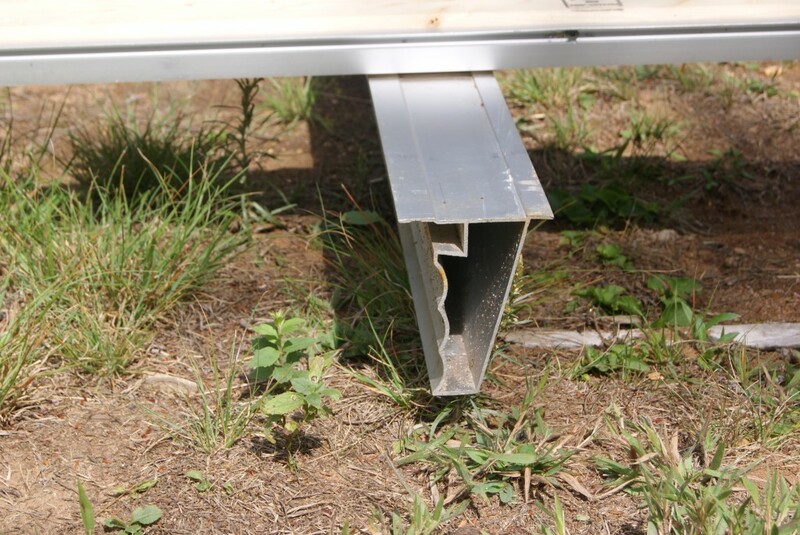 If you are unable to get aluminum extrusions, they can easily be substituted with a piece of steel angle (for example, a drywall corner). 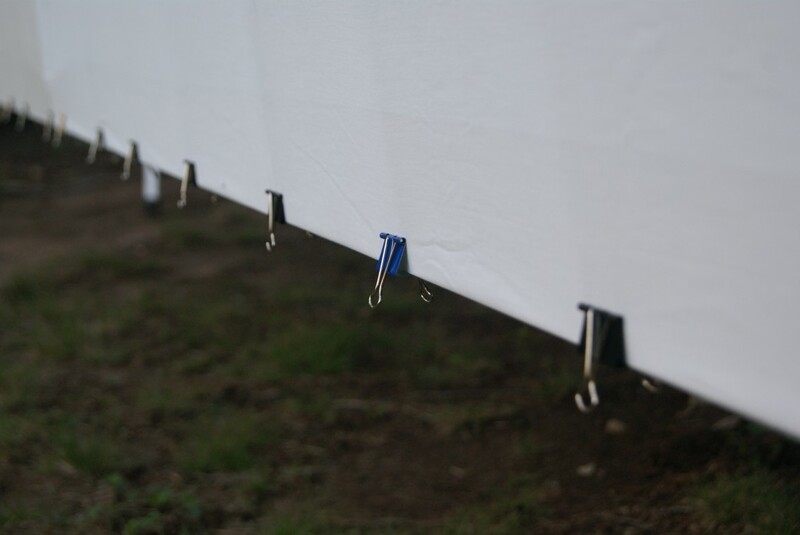 For our screen fabric, we use two white bedsheets that are sewn together. We have tried other screen surfaces, such as tarps, but the bedsheet has been the best so far. You might notice that one half of our screen is slightly darker that the other. This is not noticeable during the movie. At our cottage, we do not have electricity. This makes it difficult to get good sound. 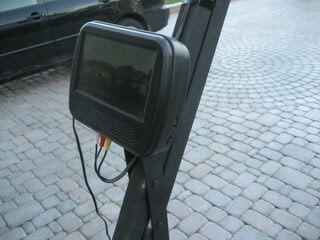 We use a cheap FM transmitter to send the audio from the movie to our van, which we back up next to the screen. We also put a small portable radio in front of the seating area to help. This system works really well, and does not require electricity. Since we don’t have electricity, powering a projector is tricky. We use a solar power system, with 2 12v batteries and an 800W inverter. This powers the projector nicely for the length of a movie. Our family loves our movie night tradition. I hope this information will help you start your own tradition. The purpose of this project was to create a unique decoration for my room. Instead of just making a traffic light that is on all of the time, I decided to add my own twist. For quite a while I have been experimenting with LEDs and syncing them to music. I started last Halloween when I made my pumpkin flash to music (see my instructable here). This project is an extension of the pumpkin, as I used the same software and a modified controller. I think that the effect turned out great, and I can’t wait to put it in my room. 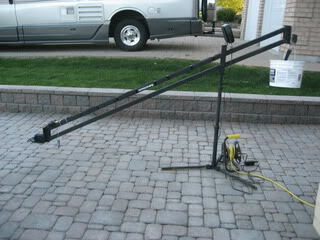 Over the past week I have been building a camera crane, or jib. For those of you who do not know what a camera crane is, it is a device that allows you to take video from really high in the air to really low in the air. 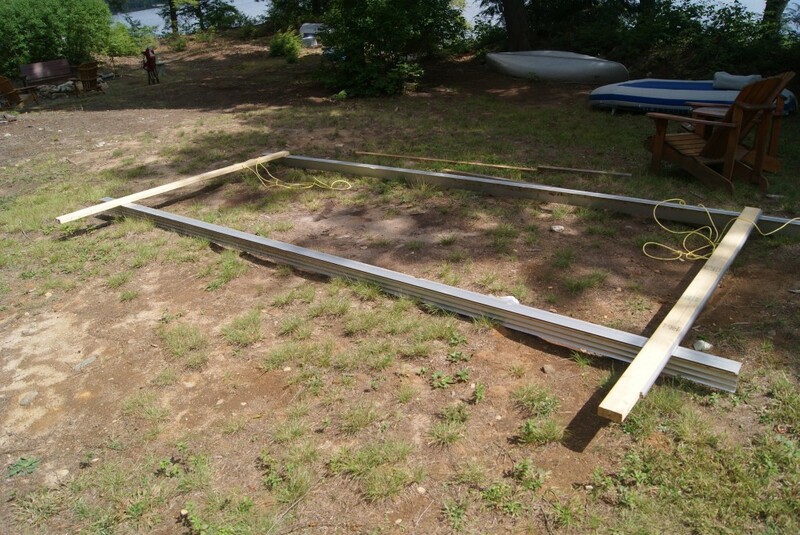 The one I built costs about $25.00, but if you have an old stand and access to a welder and some scrap metal, you could build it for well under $10.00. I am 13 I have always wanted to build a cnc machine but because inexpensive parts are hard to find in Canada I have had trouble trying to build a decent cnc controller. 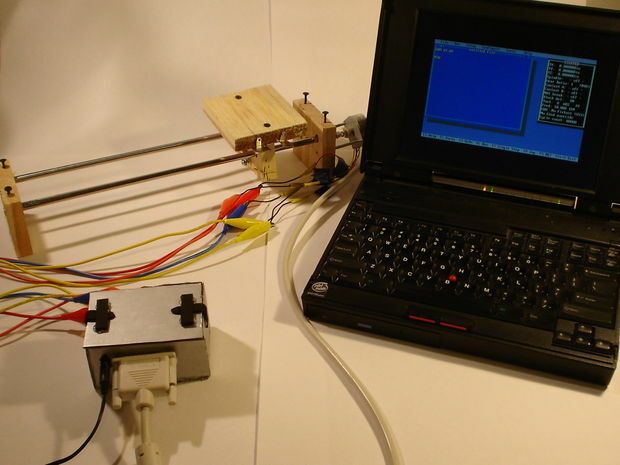 The purpose if these instructions is to show that anyone can build a cnc controller using an old scanner. The scanner I used was an old OpticPro scanner. I had previously extracted the stepper motor and experimented with it but not considered it for a cnc controller. All of the controllers on the Internet had a large number of expensive transistors or were ridiculously complex. I finally stumbled across this controller and realized I could build it. By reusing the parts from the old scanner and making the case from recycled cardboard, I am cutting back on my impact on the planet. Also, because this controller is so simple, it only needs one power suply, so, it only needs 1 12 volt (for both the logic and the motors), instead of 1 5volt (for the logic) and 1 12 volt (for the motors). This saves energy, especially when you run it for a long period of time. If you don’t already know what a cnc machine is, it is a machine that uses special motors called stepper motors to move an object a percise distance. 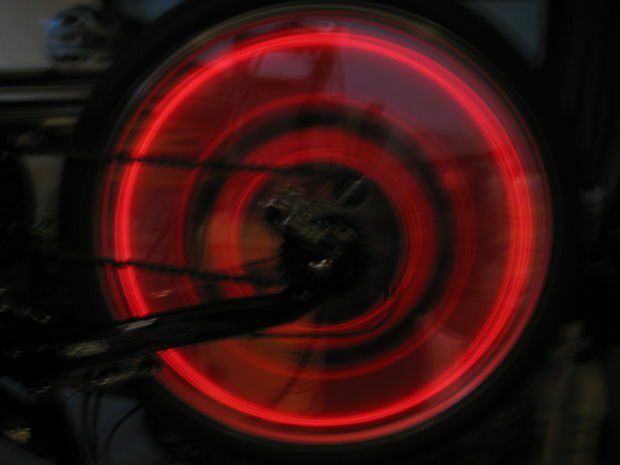 The difference between a stepper motor and a regular DC motor, is that stepper motors “Step”, not spin. if you don’t understand, refer to this artical. There are two types of stepper motors. There is Bipolar, and Unipolar. Bipolar motors have 4 wires. Unipolar motors can have 5, 6 and 8 wires. The difference between these two types of motors is that unipolar motors have 4 coil inside that, when energized in a certain order, allow it to step forward and backwards. 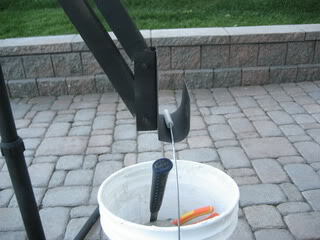 This makes them easy to control and is why we are going to use them in this instructable. Bipolar motors only have two coils that can be energized in forward, or reverse. To drive a bipolar motor you need two H-bridges. Because of this, bipolar motors motor controllers are much more complex. This is a simpler version of the Ladyada SpokePOV and the Monkeylectric Monkey Light. Unfortunatly, this version cannot spell words of pictures. It can however, make your bike stand out in the dark. This can be built in less than a day with less than $3.00 worth of parts (less if you have a bunch of LEDs laying around).